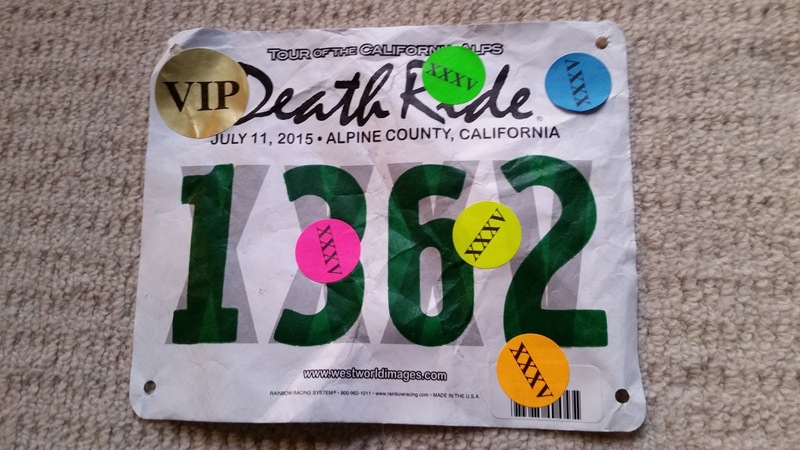 -At about age 59, I happened to drive through the area where the Death Ride takes place. I saw some cyclists, and they looked happy. The scenery was spectacular. I thought, why not? How’s that for a reason to train for a ride that goes well over 100 miles and includes five major climbs at moderate altitude (5500’-8700’) and accumulated climbing of 15,000’? -I trained hard in 2013. I rode 4 of the climbs and got within 8 miles, 1500’, of the last one. Then I bonked (which in cycling terms means you have run out of readily available calories to burn – didn’t eat enough). It’s a weird feeling. Your brain convinces your body it MUST stop its activity. You can almost fall asleep standing up. And, ironically, you do not feel at all like eating. So – I didn’t finish. -I trained harder in 2014, this time with a couple of friends. I was so ready! But I woke up with a mild case of what I think must have been food poisoning. Anyway, I couldn’t eat, even long before I got tired, so it was pretty clear it wasn’t going to happen. 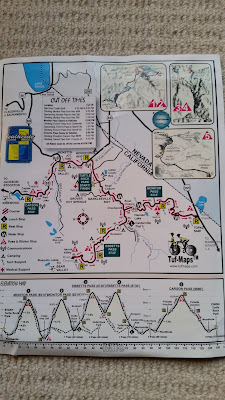 I did well for a sick day: I managed to ride 2 ½ climbs – about 60 miles with about 7000’ of climbing. But I was not even close to finishing. After I made my decision to try again in 2015, my friends sighed, but agreed to train with me. (But next year, we are touring together, right???). I told my trainer that this year I wanted the minimalist program, not the no-holds-barred we did in 2014. So we were off. It really felt good. We rode several century (100 mile) rides, some of our own designing, some organized and supported. We got so we were just fine with 10,000’ of climbing. 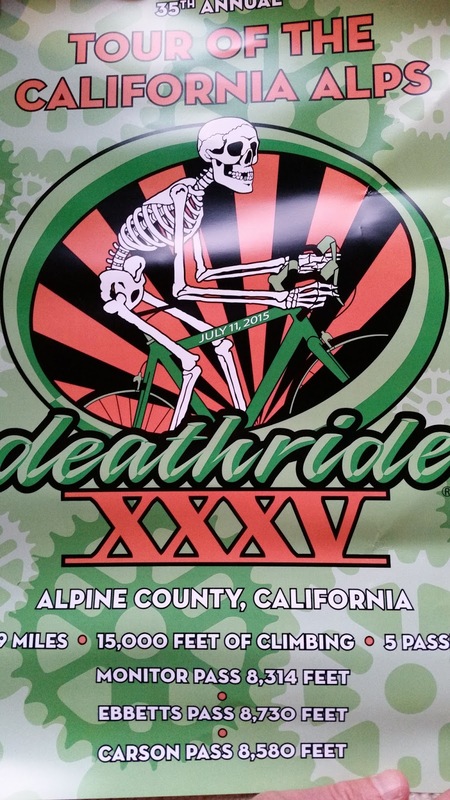 Then we went to Markleeville, home of the Death Ride, to do our final major training push, 4 of the 5 climbs. It was a hot day. One friend was on sun-sensitive antibiotics and felt fairly awful all day. I ended up having such major cramps in my legs on the 4th climb that I couldn’t even coast downhill; just getting in the pedaling position made me yelp and swerve into the road. And as I was being driven down the final descent, we saw a huge column of smoke, presumably from a forest fire. It was a rough day. We could only hope that a bad dress rehearsal meant a good opening day. The smoke was from a fire that was just starting to rage out of control. At one time, it had over 1000 firefighters working on it. It burned 26 square miles. Four of the five climbs were on roads that were closed to all traffic for about 10 days. So all of us were holding our breath, watching the news and the event updates and the weather. We soon learned that a similar ride called Alta Alpina which takes place two weeks earlier had to be cancelled. We knew that the Death Ride is a major fundraiser (the Death Ride is a huge event – more than triples the population of the county for a couple of days) for the county schools. We hated to think that anything could get in its (ok, or our) way. Finally, the winds died down. The fire retreated from Markleeville. 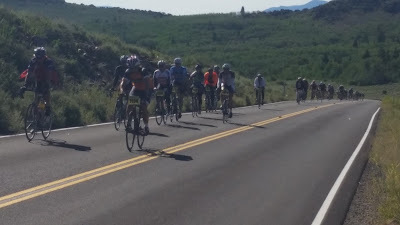 The fire agencies – there were many – agreed to allow the ride organizers to set up their rest stops and permit 3500 crazy people to ride these so recently burned roads. And the day arrived. My friends and I are persistent riders, but not very fast. In order to think of finishing this event – you must be at the last summit by 8PM – we chose to begin at 4AM. We were by no means alone. It is really quite an experience to be on a remote road, closed to all car traffic during the ride, with dozens of people on lighted bicycles. The charm of that, which goes a very long way towards alleviating the difficulty of getting started that early, had not faded this year. We heard the swish-sound of tires, an occasional “on your left,” a river we could not yet see, the huge silence in the background. It was soon clear that my friends were having a strong day. I was not. I didn’t feel terrible, but I didn’t feel great, either. But to my surprise, although they were well ahead of me, I reached the first summit in precisely the time I had allocated for it. By this time, the sun was up, but it was quite chilly. 30s, actually, and I am a wimpy Californian. That temperature is not terrible for climbing, but now we had to zoom down the east side of the mountain whose west side we had just ascended. It’s a beautiful, fun, 9 mile descent. Open country, great views. The lanes are wide enough, the pavement is perfect, no need to watch for potholes, and there are only a few sharp curves, which are well marked. This time, though, it was scary. I got so cold I was actually afraid I might lose my ability to control the brakes. Numb hands, numb feet, and when I got off the bike at the bottom of the hill, uncontrollable shivering. We sure didn’t want to spend a lot of time feeling like that, so we hurried through bananas and bathroom breaks, and turned around to climb back up. That was a pretty good way to warm up. But I had committed so much to this, was so sure I would be able to do it, was so sure I did NOT want to give so much of my life to training for it again. And I don’t know, frankly, how long I can expect to keep getting stronger. I am 63, after all. No matter how hard it felt, I really thought I’d better find a way to get it done. One of the effects of the cold seemed to be to threaten my legs with cramps. That was worrisome after the four-climb weekend. Fortunately, it turned out that although cold threatens, it does not follow through, but I didn’t know that yet. I, too, was not having fun. I was dreaming of how much better the day could feel. But it’s one thing to postpone an event that happens with reasonable frequency. I ran a bunch of 5Ks this winter, and they happen all over the place. I doubt there’s a weekend in the Bay Area that doesn’t have a couple. If I’d missed one of those, no problem. If I was having an off day, I’d just slow down a bit. It’s quite different to let the Death Ride go. This huge event happens one day a year and requires enormous preparation. I told myself sternly to get on with it! And the descents really are fun. After the first one, cold was not a problem. It was interesting, too, to see the ravages of the fire. They were not as terrible as I had feared they would be. We had ridden these very roads three weeks earlier. They looked then as they had looked for a long, long time. I heard estimates that this area had not burned for over 100 years (forest fires are a major and healthy part of California’s ecosystem; several plants found here cannot germinate seeds without the heat provided by a fire). The smell was present, but no longer terribly strong. Birds were still singing in the area, and many trees were spared. So, up the third climb, which is the longest and probably the hardest, and surely the most scenic. It starts out easy, meandering along a river with gentle slopes and frequent flat bits. Then you cross a cattle guard (I hate riding across those!) and it gets serious. As you approach the summit, you begin to climb little ramps that have brief stretches of up to 15% grade. Ouch. You are now approaching 10,000’ of total climbing in only about 30 miles of riding. A ride is considered hilly if you climb an average of 100’ for each mile. That would mean 3000’ of climbing in 30 miles. This is also the very spot where my leg cramps had started to get my attention before, so I was feeling cautious. I got off and walked a couple of the steepest ramps. But eventually, I was at summit #3. At this point, I seriously considered quitting. The thing is, I was scared of those cramps. The fourth climb involves going down the other side from the third summit, only for 5 miles, and only 1500’ of elevation change, but it was the place I had been forced to stop riding altogether the day we saw the fire starting, and there is no practical way out of that area except to go back up (if you keep going, you reach a much steeper climb, and that road is not closed to all cars for the event) so I was afraid. But my friends had already gone down to the bottom of the fourth climb, and there was no way to tell them not to wait there for me. I asked if there was anyone at the summit with a radio. There was, but he had no way of communicating with the next stop. I asked a rider to try to find them when she got down there. She agreed, and asked about how to identify them, but somehow I didn’t feel that was enough. I began to feel a bit better, so down I went. I found my friends easily, told them what was going on, and now that I was committed to the 4th climb, figured we might as well make a plan to try to finish. Since I had been having a fairly lousy day, I had not done a good job of keeping to my oh-so-carefully thought out schedule, so now we would find it a bit challenging to get to the last two rest stops before their cut-off times. We made the climb (I walked a bit more, but not too much). We made a plan at the top so as to allocate our time as efficiently as possible. We rode as quickly as we could to my motel room in town – the first and only time we would pass any commercial area all day – so as to drop off anything we no longer needed, pick up fresh supplies of food, replenish sunscreen, stretch a bit. I had hoped to make this a nice, long stop, but it turned out we really had to scramble to do it at all. Then we hurried off again, and made the first cut-off easily. Well, I mean, we had almost 15 minutes to spare. So now there was just one more cut-off, the last one before the second half of the final climb. It should have been easy. 6 miles with about 1400’ of climbing. I’d done it as my final taper-ride on the previous Tuesday. It had been easy, and had taken 45 minutes. We had an hour and 25 minutes to make it. But about this time I began to feel seriously slowed down. I walked a bit more. Not as much as I had done on my 2013 attempt. That time, my husband was pushing my bike. No, so far, this time was more about sore legs than extreme fatigue. We made it, though, with 20 minutes to spare. The last stop closed at 5:15. We had to cover 9 more miles by 8:00, and climb only 1500’. Surely we were going to make it. Not easily, though. My friends were tired, but doing pretty well. I was not. Once we reached the climbing section – this one also begins by lulling you with some flattish stuff - I told myself I’d ride until I had climbed 100’, then walk a bit. I tried it, and that first 100’ wiped me out. By this time, I had climbed well over 14,000’ and had less than two miles, 1000’ to go. I walked it. Even that was hard, and kept getting harder. After a while, my saintly friend insisted she would push my bike as well as her own, and that no matter what, we were going to finish, and do it together! I plodded on and on. At last, I reached the summit (the rest stop is about 1/10 mile past it, and downhill a bit), and right there the ride support ambulance pulled up and the guys in it tried to persuade me to accept a ride! I said no thanks, it was downhill from here. The paramedic in back opened his sliding door and tried to talk me into it. No way. I ambled down the short slope. My friends were at the gate with three bikes. It was about 7:15, over 15 hours from our start. We got on our bikes. We rode in. We collected our fifth stickers and our Five-Pass Finisher pins. We are eligible to buy the special 5-Pass Finisher jerseys. We made it! PS Yes, I am sort of celebrating this – after three years of trying – but I wish I had been able to do more, and better. PPPS There is still no apparent danger that I will take on either the marathon or the swim. PPPPS Believe it or not, my favorite t-shirt says, “No Pain, No Pain” – came from that era when everyone went around saying smugly, “no pain, no gain,” an idea I never did like. I’m going to have to remind myself to live up to that shirt better this year. PPPPPS I was used up. I discovered at the top of Carson Pass that it is actually possible to fall asleep standing up. The more you talk about this the more I think I should probably get a bicycle. And maybe work up to a century. Thank you, Mary Anne. Let us know when you are ready for the century! I am now looking forward to riding in more and more parts of the country - maybe I could come and see your lovely state and ride it, too! YES! I saw the picture of the bib below where I was reading, and had to fight my eyes to not drift down and spoil myself. Oops - yes, that's my ID, too. I forgot that Google has become increasingly sneaky about trying to get me to use that ID all the time. I have never actually entered it. 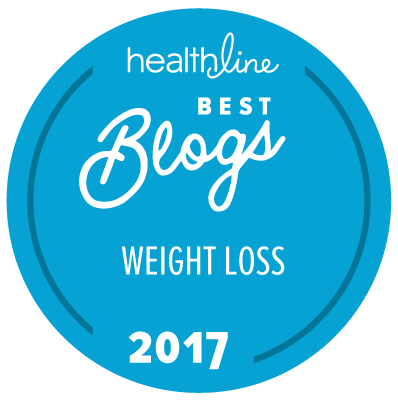 Thank you, Outsmart the Fat! You are very disciplined in your reading. I never can resist peeking ahead. Never much liked suspense anyway. You should try riding in Kentucky--there are many lovely parts to ride through, and I know there's an active road touring association even if I don't know what it's called. But here in Louisville, where I'm living now, the new bike lanes they've been building everywhere? When the bike lane logo doesn't fit inside the lane markings it may mean they haven't quite thought things through…. Congratulations! Happy Snoopy Dance for you! Thank you, messymimi! I love the Snoopy image! Damn, woman - you are incredible!!! I'm so happy you finished, and equally happy that you can cross this one off the list! Thanks, Shelley! Now if only one of my ride companions had not started talking about Death Ride 2017...That is something I find a bit scary! Tears of happiness for you, DRG!!! Congratulations!!!!!!!!!!!!!!!!!!!! You are so awesome! Thank you, Kimberley! I am very happy/relieved to be done (at least I hope we are done). But you know, there are so many people out there - I was actually passed by several on Elliptigos (hmm - what's the plural for those things?) - so I realize that there is always a bigger challenge out there if I want it. But so far, thank goodness, I do NOT! Thank you, JavaChick! It does feel good, and keeps feeling better as I finish resting up from it! Hurrah! This is so wonderful! Thank you, LynM. I am very happy to have managed (barely) to get through it! Wow, congratulations on an amazing ride! Your persistence is stunning. Most people would not try again after failing to finish the race one time. And I loved the story! What you did is more impressive to me than many professional athletic feats. This is inspiring to us all! Thanks, Dave! I actually swore I would only try once, but there is in me a streak of what one of my companions described as "just stubbornness" - she was talking about herself, too - and I found I just had to keep trying until I got it done. Now I am resisting continuing until I can make a more elegant finish...which could be followed by a faster finish, and so on. So I am not sure it should inspire anyone to do anything but be more sensible than I was! Wow!!!! I am soooo excited to read this post. I have been training for a 106 mile ride in September from my town to the Statehouse in Boston. It's not a mountainous ride AT ALL, but there are hills. This is a first for me. I was JUST thinking how I used to enjoy riding, but now that it's getting so serious, I am totally worn out. I am sore, I am tired, I don't feel good. I eat and eat and eat when I'm hungry (like 3,000 calories per day), but on the days I am riding, I don't want to eat and don't feel like eating. I read this and you say that's normal. I'm so proud of you for finishing your ride. You did awesome. Congratulations!!! Way to go, I am so excited to read this. Way to go, you! You are truly an inspiration!!! Thank you, Tracy! Have a great time on your ride. I used to participate in an AIDS ride called Ride FAR that probably covered some of your route - we started in P'town and ended up in central Mass. We managed to rack up 100 miles per day for 5 days - so we saw just about everything along the way. It is beautiful riding country. But you have to eat! Take time to do it, even if it makes your total time longer. I ate on my training rides this year, and they were way more fun than similar rides had been before I ate enough. Too bad it didn't work on the big day, but I suspect altitude was a factor. Wow! Congratulations on such a major achievement! I have just started biking at age 46 and your story is inspiring me to look for a major race for next year! Thanks! Thanks, Jo-Ann! Yes, go for that major race! There are so many great rides out there, it's hard to find enough time to do all of them. Bravo, that's quite an accomplishment!!! To paraphrase: My best friend, who loves in Lake Tahoe, did the Death Ride, and all I got is this wonderful tee-shirt!" It's red and I love it! Thanks, Dr. J! Those shirts are fun. 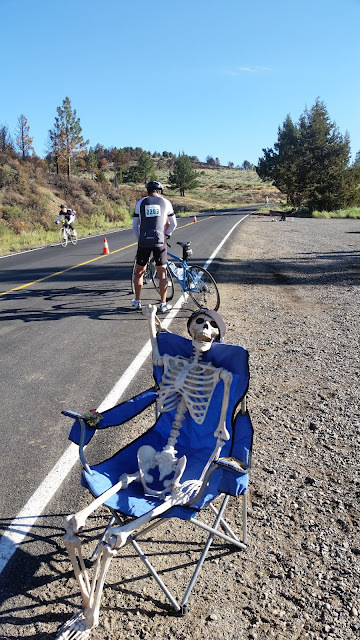 My cousin did it the one year they didn't use the Death Ride theme (it is also officially called Tour of the California Alps) and he almost decided to do it again just to get a skeleton on his jersey. D*MN WE LOVE US SOME DEATHRIDE GRANDMA!!!!!!!!! Thanks, Carla! Sorry this took me a while - am in London on my way to some much gentler bike touring. I turned 58 today. I started riding in 2010 after I bought myself a nice road bike to get more exercise. Like you, my trips became longer and longer and I did my first century in 2011. Someone had told me about the Death Ride in 2010 and I had dismissed it as something crazy and extreme. But I thought I was ready in 2014, so I signed up. I did prep well - I did 4 centuries in the 7 weeks before Death Ride, with the last one being particularly challenging. I made it up Monitor West, Monitor East, and had no problems starting up Ebbetts East. But just as I got to the top and received my third sticker, I suddenly felt light headed, dizzy, and nauseated. I sat down for a good 40 minutes and forced myself to throw up. I thought my day was finished, but I was talked into going down to Hermit Valley. I made it up without stopping, hoping I would feel better, but just had no appetite due to the nausea and could only keep down half a sandwich at the lunch stop. I rode up to my car and called it a day after 4 passes, since I knew I hadn't refueled myself adequately. On the drive to the hotel, I vowed that I would not do this again. Of course, a week later, I thought about what had gone wrong. I was too excited the AM of the ride and didn't eat or drink much, thinking I would do it on the ride. I ended up bonking because of that deficit. So I signed up for 2015. 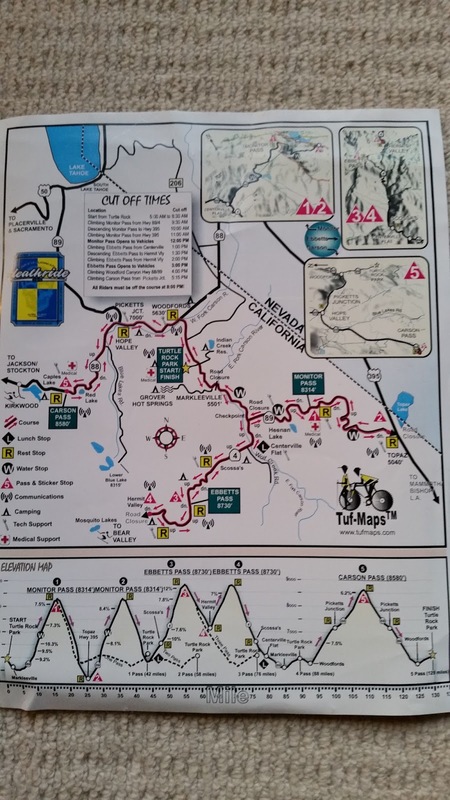 I added the Alta Alpina Challenge as part of my training. Yes, their century was cancelled, but their club did a group ride on that day and I joined them. That experience in the heat (it was 90) and altitude was valuable. On the morning of Death Ride 2015, I made sure I ate some high energy bars and drank a liter of Gatorade. Just like you, I was on my bike at 4 AM, in the pitch black and the cold, listening to the river on the right that we couldn't see. I made it up to Monitor Pass as the sun was just coming up. I ate some snacks though I wasn't hungry and made the descent. Unfortunately, about halfway up Monitor East, my left knee started to hurt. It was my iliotibial band, which I inflamed during a century ride in 2012. I had worn an IT band strap for two years with every ride, including last year's Death Ride, but stopped it as I was consistently pain free. I don't know why it started hurting (I had trained including multiple Mt Diablo rides). But I knew from prior experience that there was no way I could do three more passes (the pain is like a knife on the side of your knee with every pedal stroke). I got to the top of Monitor, rode down and dejectly turned right instead of left onto 89. I was so disappointed and mad at myself- the weather this year was perfect (72 degrees) compared to the 90 in 2014, and this was unlikely to recur. I loaded my bike in my car, thinking this was my last chance, and that I would never do this again. But I just read your report, Death Ride Grandma. You made two attempts, but didn't give up, and earned your five pass jersey on your third. I guess I'm now obligated, all because of you.